Today was that only-once-a-year event in Lənkəran, the FLEX test for students in Azerbaijan who want to go to high school in America for a year (learn more about the program by clicking here). Over 100 students from Lənkəran and the surrounding southern regions crowded into School #4 in the city to take Round One of the test, the qualifier for tomorrow’s Round Two, also at School #4. 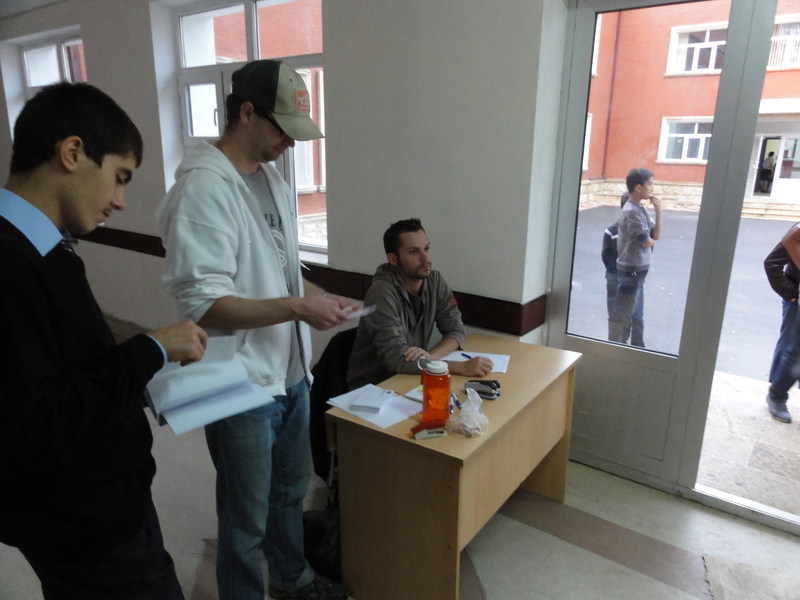 Over to the left, there are two lovable PCVs wasting hard-earned taxpayer dollars taking their time to streamline the registration process. In general, this was a pretty good turnout with 100 students showing up and that matches about what they did last year. Right now, the only successful applicant from Lənkəran in 2010 is way out in the northwest of the USA, in a small town outside of Seattle, Washington. If we’re good, maybe we can bump up the numbers of Lənkəranlı Azerbaijanis at high schools in the US this year. That standard turnout, however, didn’t come so easily. As usual, messages got dropped and a lot of schools didn’t get the message that the FLEX tests were happening today. Communication fail. Also, we PCVs had an interesting situation arise when we were told that PCVs are not supposed to be involved in education or the schools in Lənkəran. It’s pretty standard for Volunteers to be helping out, as many of these students are people we work with regularly and we want to see them succeed, encourage them to take the tests and give it their best shot. Plus, it’s just nice to have a few extra sets of capable hands around to help with organizing the students and doing registration. For us, though, it looks like someone at the local education department’s office isn’t too thrilled about us hanging around schools. At least it looks like I’m actually doing work in the picture.